- By means of payment system (WebMoney). Attention: a buyer must pay the order by 5 (five) working days at the latest since the moment of a sending to him on e-mail address of the message about an acknowledgement of the order. After this term the Internet shop has the right to cancel the order. To pay the order by a bank remittance you should choose a corresponding alternative at the stage of registration of the order. We will make a receipt on payment which can be used in any bank (for example, in "Savings bank"). All requisites and the data necessary for the payment will be automatically included in the receipt. Natural persons can pay to the order with help of online systems of banks allowing to carry out non-cash payments, for example, "Telebank" VTB, Savings Bank "ОнЛ@йн", Raiffeisen CONNECT and others. Legal persons can pay by a transfer of money to the settlement account of the Internet shop. To pay the order by clearing settlement you should choose a corresponding alternative at the stage of registration of the order. For natural persons a receipt on payment will be generated, for legal persons an account will be generated. All requisites and the data necessary for the payment will be automatically included in the receipt or the account. We draw attention that shipment of goods is made only after actual and full receipt of money resources to our settlement account. The shipment of goods by a copy of the payment order isn't made; however, we reserve the right to request copies of payment documents for a check of passage of the payment in a bank and acceleration of process of sending of the goods. Documents from legal persons by the orders by the clearing settlement should be returned to the address mentioned in the financial documents given to legal persons together with the goods. For the payment of an order by the bank card Visa or Mastercard, it is necessary for you to choose the point "Visa and MasterCard” at a registration of the order. Please, pay only after reception of an acknowledgement about a presence of the goods from Internet shop (info@handmade-russia.com or ICQ 611312681). If you have received the acknowledgement of the order, you should come into "Login" and choose in «Order history» the order which you wish to pay. On the opened page you should press on "to pass for a payment" (carius submit payform). After that you will be redirected on the site of the protected payment system. Fill corresponding lines of the payment form. If the operation carries out successfully you will be informed about it. To pay by system of payments Yandex.Money, RBC Money, Dengi@mail, Moneymail or purse Onpay you should choose point "Onpay” at ordering. Then you should choose an electronic system of payments necessary for you. After that you will be redirected on a site of a corresponding payment system. Further you should follow system helps. 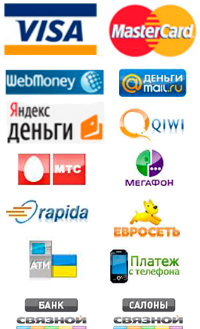 It is possible to pay the goods through system WebMoney. A payment is accepted from natural persons from any point of Russia and the world. A charge of the payment is made within several minutes. For payment of the order by means of the mentioned payment system you should choose a corresponding alternative at ordering. After a choice of a method of a payment you will be automatically moved on the page of the payment Webmoney where you can make the payment. After fulfillment of the payment you can come back in the shop. In connection with refusal of some buyers to pay the order which has arrived on mail, the decision is accepted not to use this method of payment.